I grew up in a fruit-or-yogurt-for-dessert house. You know, those houses where the only options for dessert are fruit or yogurt? At the time I felt hard done by. I imagined all my friends eating ice cream sundaes and banana splits while I sat eating my apple slices. But now I realize my mum was just trying to make sure we ate nutritious food. Fast forward 30 years and I am that mom offering nothing but fruit and yogurt for dessert. Sometimes, though, I try to make it a little fancy to make my children feel as though they are eating something special. 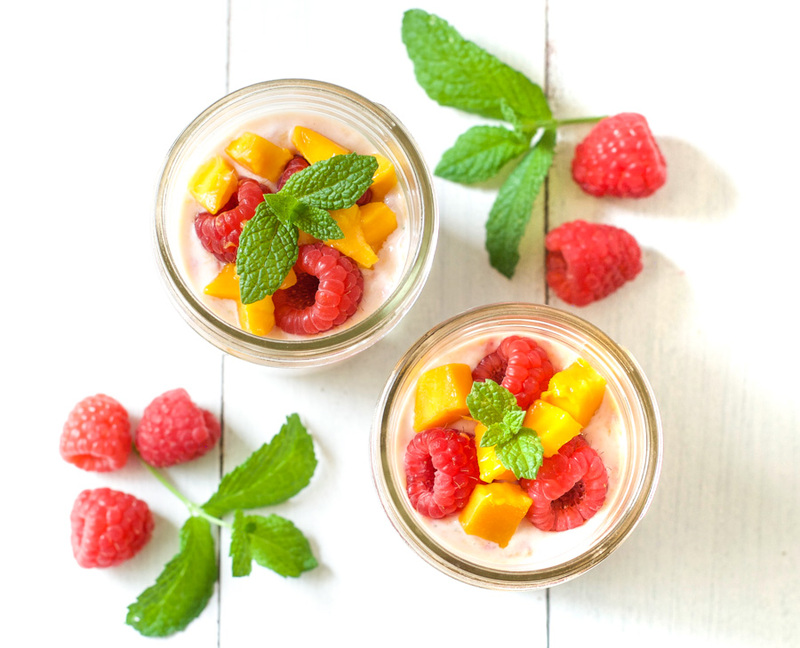 This 5-ingredient mango raspberry fool is a great example of that. 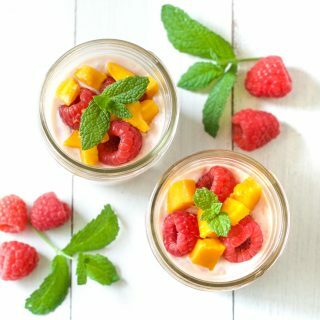 This mango raspberry fool is made with plain yogurt (I used Siggi’s for extra protein but you can use Greek), fresh fruit, mint leaves, and a touch of honey. It takes 5 minutes to throw together, and you can top it with cut fruit and fresh mint to make it look extra fancy. 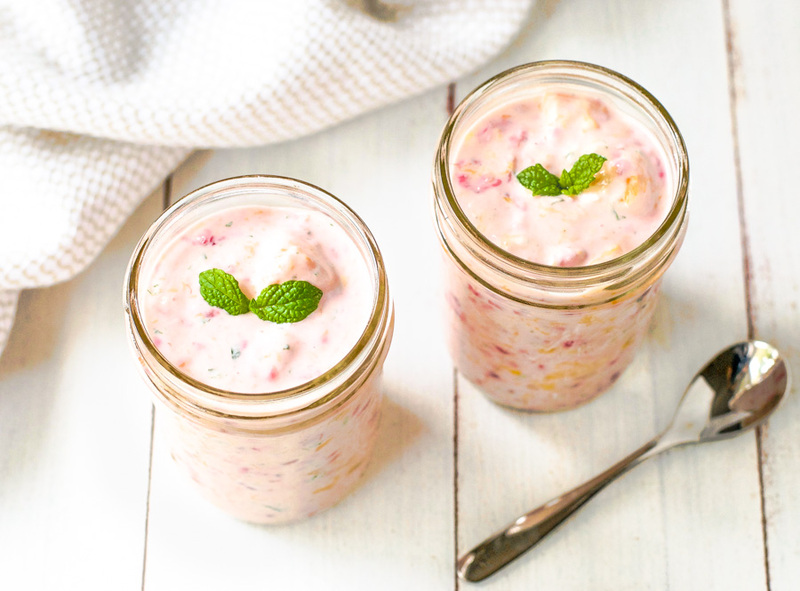 It is creamy and sweet, with a delicious hint of fresh mint, and really tastes like a decadent dessert. What is your favorite healthy dessert? I’d love to hear in the comments. Edit: Right after I hit the publish button on this post, my (American) husband asked me why I decided to name this dessert an imbecile. It didn’t even occur to me that not everyone knows what a fruit fool is. So just in case you don’t have an English-to-American translator hanging around, a fruit fool is a dessert that is traditionally made by stirring stewed fruit into a sweet custard. In modern times, people tend to use whipping cream instead of custard. I decided to make it a little healthier by using whole milk yogurt, and a little easier by not stewing the fruit. So with that explanation, you can see that my dessert is, in fact, nothing like a traditional fool, but who’s judging, right? 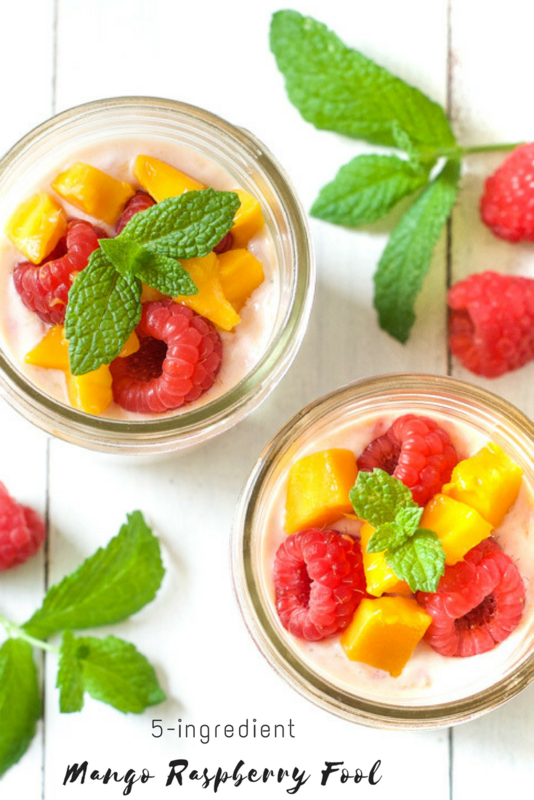 This decadent-tasting 5-ingredient mango raspberry fool takes 5 minutes to make. You can top it with cut fruit and fresh mint to make it look extra fancy. Place all the ingredients in a bowl and mix well. Add honey to taste. Pour the mixture into 4 containers (I like to use mason jars). Top with extra cut fruit if using.